A map of Shell's licenses. (c) Nicolas Rapp, for Fortune Magazine (link to story below). OCSLA authorizes the Secretary of the Interior to lease portions of the Outer Continental Shelf to companies for oil and gas exploration, provided that they receive a multitude of permits from various agencies. If exploration is successful, another round of permitting must take place before a company can undertake development and production of the resources. The government began selling leases in 2002, and Shell purchased blocks in 2005 and 2007. The Minerals Management Service, which formerly housed BOEM, the Bureau of Safety and Environmental Enforcement (BSEE) and the Bureau of Ocean Energy Management, Regulation and Enforcement (BOEMRE) as one entity, reviewed Shell’s exploration plans and also considered its oil spill response plan in accordance with the Clean Water Act. Shell submitted its exploration plan for its Beaufort Sea leasing areas in November 2006. MMS approved the proposal in February 2007. Yet the North Slope Borough and the Alaska Eskimo Whaling Commission challenged the approval in court. The 9th Circuit Court of Appeals denied MMS’s approval, claiming that its analysis of potential environmental impacts was not sufficient. This halted exploration in the summers of 2007 and 2008 and ultimately forced Shell to create a new exploration plan. The MMS approved it, and in a second court case, the 9th Circuit upheld the agency’s decision. In the spring of 2010, however, an obstacle Shell could not have foreseen arose in the Gulf of Mexico: the Deepwater Horizon oil spill. Soon afterwards, Secretary of the Interior Ken Salazar issued a moratorium on offshore Arctic drilling, which was not lifted until yet another summer had passed. Shell then created a new exploration plan, which it submitted to the BOEM and the BSEE in May 2011. BOEM reviewed the oil exploration plan, while BSEE scrutinized the oil spill response plan. Both bureaus issued approvals to Shell, but the indigenous groups and environmental NGOs still found reason to sue again, this time for two main reasons. First, they claimed that Shell’s exploration plan did not adequately inform BOEM about its oil spill response plan. Second, they alleged that the well-capping stack and containment system, which Shell proposed to use in response to oil spills, was not adequately described. The court, however, did not side with the petitioners as it had in 2007. The three-judge panel did not find that either bureau “acted arbitrarily or capriciously” in issuing approval. They also wrote, “BOEM’s conclusion that well-capping technology is now feasible in the Arctic is supported by substantial evidence in the record.” In fact, this is the very technology that BP deployed to contain Deepwater Horizon. Well-capping has not actually been used in the Arctic before, but as the panel found, it is up to BOEM to decide with its scientific expertise whether a certain technology is appropriate, not the court. The petitioners also argued that Shell was inconsistent in stating that while it would take 44 and 34 days, respectively, to drill at its Torpedo and Sivulliq sites (map), it would only take 25 and 20 days to drill relief wells in the same locations. Yet the court found that that BOEM is not required to state on the record how it reconciles the differing time estimates. Thus, BOEM’s and BSEE’s approvals of Shell’s plans were upheld, and only a few more court battles remain. The full text of the decision in Native Village of Point Hope v. Ken Salazar is available here as a PDF. Shell spokesman Curtis Smith stated, “There are other appeals still pending, such as those of our air quality permits, but the favorable ruling on the exploration plan is a substantial boost for us.” The EPA granted Shell ten air quality permits in September 2011 to permit the Noble Discoverer drillship, the Kulluk drilling unit, and a support fleet of icebreakers, oil spill response vessels, and supply ships to drill in the Beaufort and Chukchi Seas for up to 120 days each year. As Shell is hopeful for its prospects this summer, both the Noble Discoverer and Kulluk are being outfitted and “winterized” in a Seattle shipyard in preparation to sail to Dutch Harbor, Alaska in mid-June. Some might be surprised that Shell will, in all likelihood, finally be able to begin drilling exploratory wells in the Arctic under President Barack Obama’s watch. But Obama may have calculated that in an election year, allowing Shell to begin drilling would illustrate his moderate environmental stance to conservatives, especially after he postponed making a decision on Keystone XL. The New York Times reports that during a briefing on the Deepwater Horizon oil spill, Obama asked, “Where are you coming out on the offshore Arctic?” He continued, “It’s not deep water, right?” Indeed, the oil sits a mere 150 feet below sea level rather than 5,000 feet, as much of the oil in the Gulf of Mexico is. Yet ice, frigid temperatures, and snowstorms pose hazards not encountered farther south. The MMS estimated that the Beaufort Sea holds 2-7 billion barrels of economically recoverable oil and 3-20 trillion cubic feet of economically recoverable natural gas, while the Chukchi Sea could hold between 0.15-12 billion barrels of oil and 0.5-54 trillion cubic feet of natural gas . Even if the maximum amount of both resources was found and extracted, the oil and gas would be able to meet all of U.S. demand for only a little more than two years. To illustrate, the U.S. used 6.99 billion barrels of oil in 2010 and 24.37 tcf of natural gas. Yet producing some oil is better than no oil for Alaska’s state coffers. In 2010, Alaska produced 219 million barrels of oil, only 30% of the amount it produced at its peak of 718 million barrels in 1988. Drilling in the seas north of Alaska could breathe new life into a declining industry. This promises not only an economic boon, though. Producing more oil may also be an infrastructural necessity, as the Trans-Alaska Pipeline might soon not have enough of the black stuff flowing through it to keep the pipe from clogging and freezing. Now that the price of oil sits over $100, it is economically profitable for Shell to extract it in the Chukchi and Beaufort Seas. The company’s break-even point is not known, though analysts estimate it could be as low as $30 or as high as $80. Either way, Shell seems positioned to profit if it finds oil. This was not the case in the 1980s, when oil fell to under $30 a barrel at and Shell abandoned its attempts to drill for oil in the same seas it will likely be drilling in this summer. It looks like this summer, after seven years of back and forth, the drillship will triumph over the umiak (whale boat). The only real obstacle that still stands in the way of Shell’s designs, provided that the appeals over the air quality permits are rejected, is nature itself. 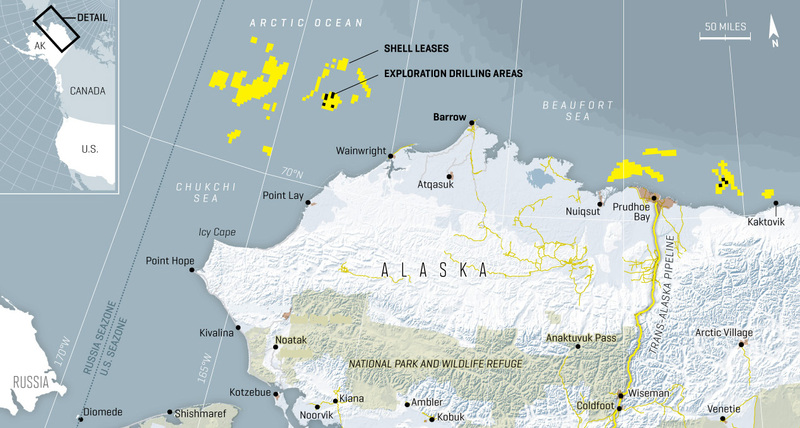 With some of the most multi-year ice the Alaskan Arctic has had in decades, the waters around Shell’s lease sites might not be completely ice-free until August, shortening the drilling season. Shell already agreed to conclude drilling in the Beaufort Sea by October 31 and by September 24 in the Chukchi Sea to avoid the possibility of drilling in waters where ice is beginning to form, so it might have less than two months to operate in the latter area. But for Shell, the very fact that it could begin drilling this summer is a dream come true – and a nightmare to others.